Take your Buying Group to a new level. Instantly. Adding new members to your Buying Group or Coop used to be a long and tedious process. You had to convince retailers one by one to join it, while persuading and negotiating with vendors to offer preferential prices and discounts to your retailers. WEGOTRADE now enables you to reap the rewards of your hard labor! Taking your Buying Group online with WEGOTRADE means you can offer your retailers and vendors new tools to improve and facilitate trades between them, while you grow your membership rapidly and gain access to numerous potential vendors. All in one place. This is where online trades happen. This is how you truly monetize the power of your organisation. 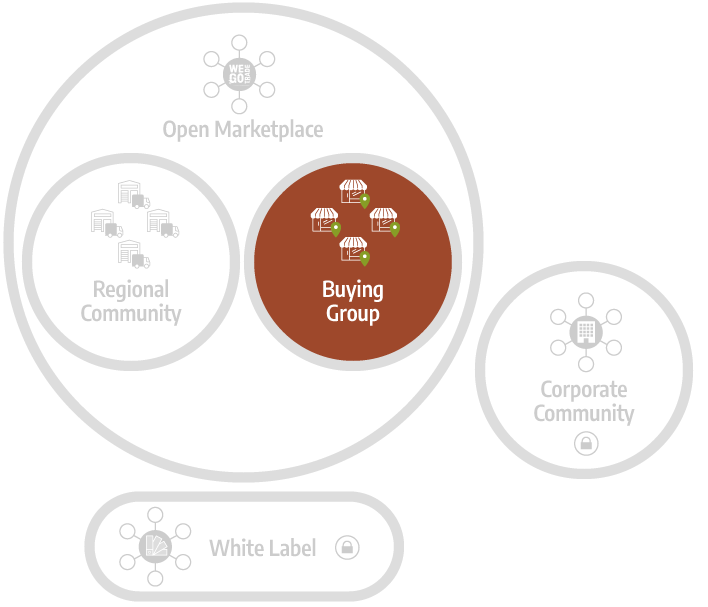 Bringing your existing Buying Group or Coop on WEGOTRADE is key in opening new business opportunities. This solution is particularly beneficial to existing associations. It offers them a robust platform that facilitates trading between their members, and also streamlines the entire purchasing process. WEGOTRADE’s Buying Groups offer advanced features and multiple benefits without having to invest in a costly ecommerce website. You have full control over who joins your community. You have access to detailed reports and statistics to better understand how trading occurs within your organisation. These stats can also help you negotiate prices with new vendors and make them start selling to your group. Offer the retailers in your group to buy from multiple vendors from a unique, user-friendly mobile app or website. This gives them much more choice, and it makes it much faster to place purchase orders. Offer the vendors in your group to reach all your retailers directly by publishing their products catalog and sending them promotions on WEGOTRADE. Indeed, vendors will find it much easier to reach many new retailers at once, and this will also allow them to reduce the cost of processing purchase orders. Having your Buying Group on WEGOTRADE can even generate new revenues for your organization! Imagine the WEGOTRADE platform as a set of innovative online tools that help your organisation grow stronger and bring business to a whole new level.